On saturday, the club held its Annual Awards and Presentation social event. Arranged by Gill Lock the event took place in the historic old Town Hall at Kenfig, attached to the Prince of Wales Inn. 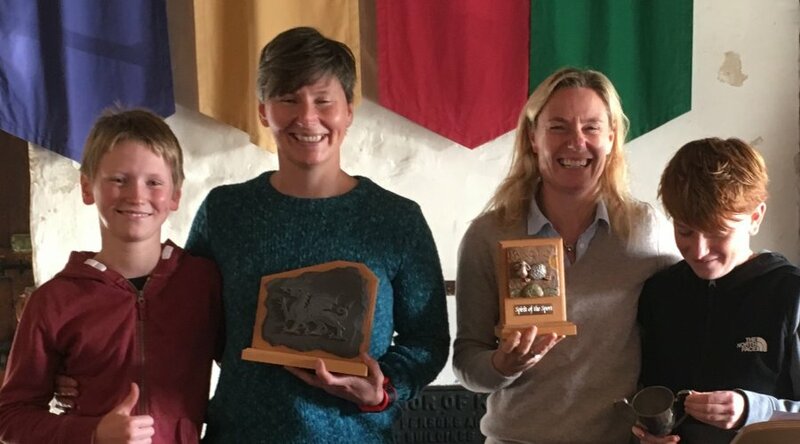 A fantastic buffet was laid on and in the ancient surroundings the trophies for the 2017-18 Winter and Night Leagues, the 2018 Summer League and the 2018 Club Championships were presented. The committee awards were also presented. These went to Oscar Healy for Best Junior, to William Lake for Most Improved Junior, to Sam Healy for the Spirit of the Sport and to Kerina Lake for the Chairmans award. The full final league tables are below. Junior man: Oscar Healy, Junior woman: Grace Juliff, Veteran man: Christopher Lewis, Veteran woman: Gill Lock, Senior Man: Iestyn Evans, Senior Woman: Margaret Reynolds. Congratulations and well done to all the winners. Welcome to the website for Swansea Bay Orienteering Club. Orienteering is a sport that involves navigation between control points marked on a map in the quickest time, choosing your own best route. It is a challenge that exercises both mind and body. There are many benefits of becoming a member of SBOC. If you would like to keep up to date with what's going on, you can sign up for email notifications below. Copyright 2018 Swansea Bay Orienteering Club All Rights Reserved.